Jesus Diaz: How long does it take you, on average, to create one of these models? MC: I usually just dive right in. I'll come up with an idea, and start building immediately. With these Star Wars character models, I always start with the head first. And, the whole time I'm building that, I'm working out in my mind how the rest of the model will go. When building people, I try to visualize, based on what I've already done, how the next portion or their body will need to look, in proportion, to match. It's fun to see a character "come to life" like this, and I think that motivates me to just keep building, in one sit-down session, and work until it's done. Nothing is ever built according to instructions—it's all custom, original work, using a single photograph of a character as my guide, and my imagination to translate that into LEGO form. JD: What was the most complicated of them? JD: But what's the one that really was a tough one? MC: R5-D4, I recall, was a pretty complicated build. Today, I could think of at least a couple different ways of accomplishing the same overall design using much simpler techniques that I've discovered since then; but at the time, I forced myself to find a way to create some kind of internal structure that'd allow me to build his body as a dodecagon (12-sided polygon). He ended up being probably the heaviest model I've ever built, too, and despite the very precise and delicate construction, the final model came together extremely solidly. Like a brick. JD: About your latest design. 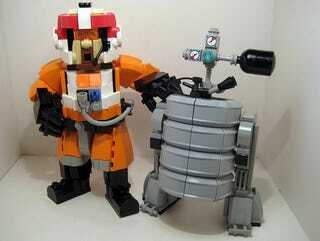 I can't help it, it makes me laugh and... dream about an automated astrokeg... Any plan to build the actual B3-3R? MC: Alcohol and technology—is there any more dangerous yet more entertaining combination? Oh man, how sweet would that be to have a real kegbot? I only WISH I knew enough about robotics to make that happen. Seriously, that'd be the ultimate Star Wars drinking game accessory. JD: I'm SO there, dude. And what's your favorite model? MC: I think my General Grievous was my favourite. He was just so incredibly poseable. And, as a character, he was so unique. Droids are always much more visually interesting, I think, because of all the detailing, and he being a cyborg made him the best of both worlds—he was intricate, yet had so much personality, I think. Plus, he was packed with features and accessories, including a heart in his chest and arms that split in two so he could hold the four lightsabers I built for him. Like most of the things I build, he was eventually salvaged for parts so I could build new models; but, I have enough of him still assembled that I'm sure I could reconstruct him if I ever wanted to. Well Mike, thanks for the answers, the great models and confirming that, after years of electroshock therapy, I'm back at being a complete LEGO whore. Can't wait to finish the Falcon to destroy it and start making my own.